Coral reefs are calcareous structures (meaning that they contain calcium carbonate) formed through complex interactions within the ocean biome (Barnes, 1980). Various organisms including corals, algae, sponges, snails, clams, worms, shrimp, and crabs inhabit reefs (Barnes, 1980). Scleractinian corals produce calcium carbonate (the compound that forms corals' hard, supportive, and protective skeletons) while hermatypic corals build the reef (Barnes, 1980). The reef-building corals maintain a symbiotic relationship with zooxanthellae, a brown algae. Due to this photosynthetic organism, coral reefs can be considered autotrophic (Barnes, 1980). Currents carry plankton into the reef, which serve as a source of nutrients for the corals (Barnes, 1980). Algae is present throughout the reef, and in particular, coralline red algae are vital contributors to reef formation. They deposit calcium carbonate over old coral skeletons and contribute to reef cementation (the process by which layers of calcium carbonate are fixed together in order for corals to grow) (Barnes, 1980). Barrier reefs are categorized by a lagoon that separates the reef and nearest landmass (Barnes, 1980). The reef platform (the landscape where corals grow) consists of three main parts: the reef front, reef crest, and reef flat. The reef front faces the open ocean and slopes upward to a shallow depth (Barnes, 1980). The corals that grow here are subject to a large amount of wave stress because nothing is blocking the path of oncoming waves (Barnes, 1980). To counteract this, reef protrusions placed intermittently with sand-filled cavities on the reef front create a spur and groove formation that helps to dissipate wave energy (Barnes, 1980). The reef crest (an area of slightly higher elevation) shields the reef flat (a level, shallow-depth area where corals grow) from oncoming waves. In barrier reefs, the flat declines into the lagoon (Barnes, 1980). Reef growth is a cyclic process involving destructive and constructive phases (Barnes, 1980). What are referred to as boring organisms, namely sponges and bivalves (mussels, scallops, and clams), break down corals (Barnes 1980). In the process, detritus, or debris resulting from the degradation of the corals, is produced, and once enough builds up, it smothers the boring organisms (Barnes, 1980). Transitioning to the constructive phase, the detritus and organisms including but not limited to gorgonian coral skeletons (a type of soft, branching coral), calcareous algae, sponges, and mollusks fill the spaces between the broken down corals where they then undergo lithification (compaction and consolidation) and are cemented with magnesium calcite (Barnes, 1980). This is the process that occurs after the establishment of coral reefs. Rewinding 84 million years, one can examine the early formation of one of earth’s most spectacular features: the Great Barrier Reef (Johnson, 2004). The Great Barrier Reef is the world’s largest reef and supports more than 200 species of scleractinian corals (Johnson, 2004). Three major processes resulted in the formation of the Great Barrier Reef: northward continental drift, divergence of Australia’s northeastern continental margin, and Marine Isotope Stage 11. This established an environment which provides five main factors controlling reef growth including temperature, salinity, water turbulence, depth, and turbidity. The Great Barrier Reef extends over an estimated area of 225,000 km2 about the Queensland continental shelf, situated between 24˚ 30’S and 9˚ 30’ (Haynes et al., 2007; Hopley et al., 2007). Located 40 to 150 km from Australia’s northeastern coast in the Coral Sea, the Great Barrier Reef stretches over a distance of 2300 km (Haynes et al., 2007; Hopley et al., 2007). Figure 1. 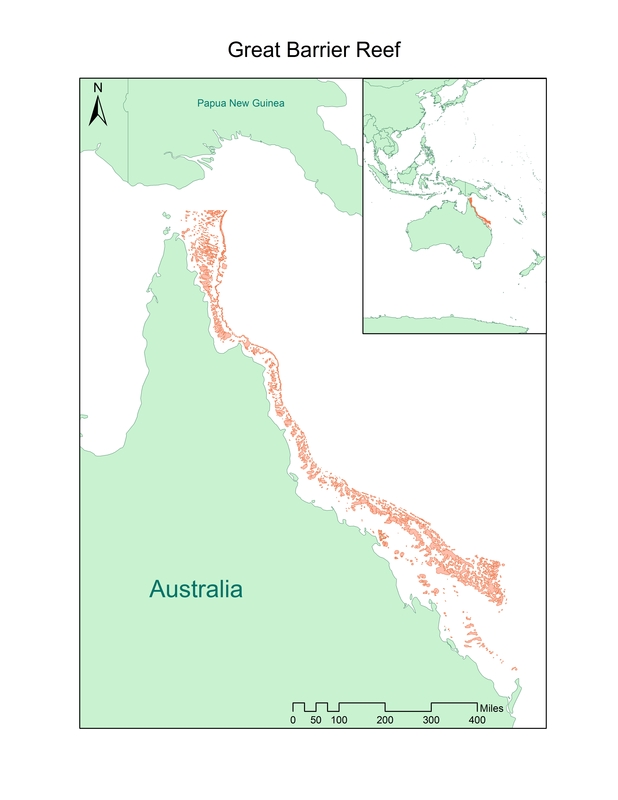 Study area map of the Great Barrier Reef located off the northeastern coast of Australia. The inset map displays Australia's location in the western Pacific Ocean. Five factors control the continual formation and survival of the reef: temperature, salinity, water turbulence, depth, and turbidity (Hopley, 1982). The Great Barrier Reef's position in the Coral Sea meets these five factors optimally, such that it creates the thriving, diverse reef seen today. The ideal temperature range for coral growth is 26 -27˚C, though corals can survive temperatures of 18-36˚C for limited periods of time (Hopley, 1982). Extended periods of time exposed to waters with temperatures outside of this range can lead to coral death (Hopley, 1982). The water temperatures of the Great Barrier Reef region have remained above 24˚C for the past 700,00o years, which is close to the ideal temperatures for reefs (Johnson, 2004). Another critical growth factor for reefs is salinity. Corals and coralline algae have an optimal salt concentration of 36 parts per thousand, though can withstand salinity between 30 and 40 parts per thousand (Hopley, 1982). Salinity of the Coral Sea generally falls within the range of 35.41 and 35.59 parts per thousand, providing a nearly optimal salt concentration for the reef (Rotschi and Lemasson, 1967). Large amounts of rainfall, surface runoff, and an influx of freshwater from rivers can contribute to a lower salt concentration (Hutchings et al., 2009). Turbulent waters can cycle sediments in and out of the reef, replenishing nutrients and removing biogenic (organism-produced) carbon dioxide (Hopley, 1982). The prevention of siltation (what Merriam Webster defines as the deposition of fine sediments), development of zonation (the zonal arrangement of different coral species), and possible increase in oxygen levels are other effects of water turbidity being studied (Hopley, 1982). Continual water movement also helps decrease the coralline algae’s competition because other feeders like fleshy algae cannot survive the high-energy waters (Hopley, 1982). At the same time, wave stress limits coral branching patterns and size because fragile, complex corals could not withstand the high energy of waves (Mistr and Bercovici, 2003). Corals in areas of less current form more intricate branching patterns and cover more area (Mistr and Bercovici, 2003). Reefs near Queensland, Australia have formed parallel to the flow of the East Australian Current, pointing to the correlation between oceanic currents and reef configuration (Mistr and Bercovici, 2003). It is evident that as water depth increases, light decreases. Access to light controls calcification rate (the rate at which calcium carbonate solidifies into coral tissue) and allows for photosynthesis (Mistr and Bercovici, 2003). Calcification rate triples in sunlight versus darkness, yielding carbon dioxide that can then drive photosynthesis (Mistr and Bercovici, 2003). Via photosynthesis, zooxanthellae supply oxygen and nutrients to the coral (Mistr and Bercovici, 2003). Deeper than 40 m, zooxanthellae photosynthesis can only produce half of reef’s carbon requirements, so below these depths corals must rely on alternative feeding processes (Hopley, 1982). As a result of the decrease in efficiency of calcification and photosynthesis, species diversification decreases once depth reaches 20m, or once 75% of surface illumination is lost (Hopley, 1982). While access to light is essential for coral reefs, a delicate balance must be struck. Coral reefs must exist in areas of enough light to prompt an optimal level of photosynthesis, but not so much light as to lead to coral bleaching (a loss in symbiotic algae and therefore coral pigment, which can lead to coral death) (Van Oppen and Lough, 2009) . In addition, the intense lighting and water temperature of the Great Barrier Reef provide an ideal environment for phytoplankton, which transform nutrients to organic matter (Haynes et al., 2007). Accumulation of organic matter in sediments leads to the smothering of corals. In addition, an unnatural amount of dissolved organic nutrients can alter the egg, embryo, and rate of fertilization of corals (Haynes et al., 2007). Larvae are at greater risk for improper maturation and decreased survival rates (Haynes et al., 2007). Often, storms are the cause of turbidity, or unsettled sediment, which plays an important role in sunlight access (Hutchings, 2009). Contaminants, surface runoff, and turbulence disturbing the ocean floor contribute to sediment load (Hopley 1982). If the displaced sediment is carried away from the reef via waves rather than settling on the reef, a turbidity of 100 mg/L or more is tolerable (Hutchings, 2009). In turbid waters, corals typically cannot grow in water deeper than 8 m (Hutchings, 2009). It is more difficult for larva to settle in areas with accumulated sediment (Hutchings, 2009). The debris from bio-erosion due to burrowing organisms may also restrain reef coadunation (Haynes et al., 2007). In addition, as nutrients accumulate, macro-algae accumulate on the corals (Haynes et al., 2007). This accession blocks sunlight, a critical environmental factor for coral growth and photosynthesis (Haynes et al., 2007). Further, crown of thorns starfish thrive in nutrient-rich waters and feed on the corals, contributing to thirty-seven percent degradation of coral reefs (Webster et al., 2012). Rivers bring an influx of sediments to the Coral Sea which can settle on the floor in calm water (Johnson, 2004). The three main rivers that transport sediments to the Great Barrier Reef include Fitzroy River, Burdekin River, and Normanby River (Johnson, 2004). Southeasterly trade winds push the sediments to the north along the coastline (Johnson, 2004). Most sediments from the land only reach 10-15 km offshore, though sediments from flood plumes can be carried to the mid and outer shelf (Johnson, 2004). Sediment load divides the Great Barrier Reef into three shelves (Johnson, 2004). The inner shelf (0-20 m deep) houses most of the river sediments, is composed of a little over 30% carbonate material, and is characterized by fringing reefs (Johnson, 2004). The mid shelf (20-40 m deep) is made of 30-80% carbonate sediment, and the outer shelf (40-80 m deep) is composed of more than 80% carbonate (Johnson, 2004). The evolution of the Great Barrier Reef began with the northward continental drift of Australia (Johnson, 2004). Eighty-four million years ago (mya), Australia was attached to Antarctica as part of the landmass Gondwana (Johnson, 2004). As Australia drifted north, it entered tropical waters which provided optimal temperatures (one of the primary growth factors) for coral growth, allowing the reef to develop from north to south (Johnson, 2004). Approximately ten mya, the average temperature of the waters of the Queensland Plateau fluctuated between 20 and 24˚C (temperatures allowing for limited coral growth) (Johnson, 2004). It was not until 700,000 years ago that the water temperature remained above 24˚C, accelerating coral growth and prompting reef development (Johnson, 2004). As Australia relocated northward via continental drift (satisfying optimal temperature), optimal depth was being established concurrently (around 60 - 55 mya) through crustal divergence, or separation (Johnson, 2004). The continental margin (the zone of convergence between continental and oceanic crust; refer to Figure 2) of northeastern Australia began to diverge, allowing a piece of Australia’s continental crust to move further east (Johnson, 2004). Eventually, the continental margin reached the present-day Queensland Plateau which sank to 1000 m below sea level, preventing reef formation except for in a select few places of higher elevation (Johnson, 2004). As sediment from the coast was transported, the deposition helped to counteract the subsiding of the continental shelf (Johnson, 2004). Figure 2. A diagram of a continental margin. Australia's continental crust moved east as the oceanic crust diverged to the west. The reef later formed on the continental shelf (Johnson, 2004). It is speculated that the formation of the coral reef system observable today began approximately 365-452 thousand years ago (ka) (Hutchings et al., 2009). Around this time (450 ka) the Marine Isotope Stage 11, an interglacial period with climate comparable to that of the present day, occurred (Hutchings et al., 2009). Changes in Earth’s orbit called Milankovitch cycles (e.g., obliquity, eccentricity, and precession of the equinoxes) control incoming solar energy, leading to climatic periods that promoted the formation and melting of ice sheets in the northern hemisphere (Hutchings et al., 2009). Over the past 500,000 years, on a global scale, sea level experienced 17 cycles of fluctuation (Hutchings et al., 2009). Between each glacial and interglacial period, the global sea level changed by 120 m (Hutchings et al., 2009). During interglacial periods, as sea level rises, coral reefs can aggregate at rates of 10 m per thousand years or faster (Hutchings et al., 2009). As the sea level rose over the continental shelf at a rate of 9 meters per thousand years, the shoreline receded at a rate of 10 meters per year (Johnson, 2004). The currents brought coral larvae that started growing on nutrient-rich substrate and eventually contributed to the formation of this reef (Johnson, 2004). High sea level also allowed for the aggregation of carbonate sediments which contribute to the constructive phase of reef growth (Johnson, 2004). After coral reefs grow to sea level or sea level stabilizes, growth rate decreases (Hutchings et al., 2009). In contrast, low sea levels lead to erosion, limestone dissolution, and vegetation growth (Johnson, 2004). Speculation suggests that rivers terminated as deltas on the Great Barrier Reef’s present-day shelf or flowed into the canyons on the shelf edge (Johnson, 2004). At times of low sea level, the rivers deposited sediments onto the present-day shelf, which was probably a floodplain (Johnson, 2004). Erosion and transport of sediment to the coast caused the shoreline to recede (Johnson, 2004). The formation of a complex ecosystem such as the Great Barrier Reef requires complex processes. The evolution of the Great Barrier Reef began with the detachment of Australia from Antarctica, which allowed the northeastern coast of Australia to enter tropical waters ideal for coral growth (Johnson, 2004). Divergence of the continental margin to the Queensland Plateau established a suitable depth for reef formation (Johnson, 2004). Sea level fluctuations during glacial and interglacial periods were crucial to reef development as the cycles of erosion and deposition contributed to shoreline recession and reef construction (Hutchings et al., 2009; Johnson, 2004). Through the early evolution of the Great Barrier Reef, the northeastern coast of Australia came to reside in the Coral Sea, an environment ideal for reef growth. The Coral Sea’s average temperature and salinity fall closely within the range of optimal values (Johnson, 2004; Rotschi and Lemasson, 1967). Water depth controls oxygen supply, calcification rates, and species diversification (Hopley, 1982; Mistr and Bercovici, 2003). Turbulence affects the branching patterns of corals while circulating nutrients into and carbon dioxide out of the reef (Hopley, 1982; Mistr and Bercovici, 2003). The final major factor of reef growth is turbidity, which can reduce the amount of sunlight that reaches the corals and promotes bio-erosion (Haynes et al., 2007; Hutchings, 2009). A fragile balance of these interactions among organisms and environmental factors combine to produce and maintain an ecosystem so rich in diversity and history. Barnes, R. D. (1980). Invertebrate Zoology. Philadelphia, PA: Saunders College. Haynes, D., J. Brodie, J. Waterhouse, Z. Bainbridge, D. Bass, and B. Hart (2007). Assessment of the Water Quality and Ecosystem Health of the Great Barrier Reef (Australia): Conceptual Models. Environmental Management, Vol 40. Hopley, D. (1982). The Geomorphology of the Great Barrier Reef: Quaternary Development of Coral Reefs. New York City, NY: John Wiley & Sons, Inc.
Hutchings, P., M. Kingsford, O. Hoegh-Guldberg (Eds.) (2009). The Great Barrier Reef: biology, environment and management. Collingwood, Australia: Csiro Publishing. Johnson, D. (2004). The Geology of Australia. Cambridge, UK: Cambridge University Press. Mistr, S., and D. Bercovici (2003). A Theoretical Model of Pattern Formation in Coral Reefs. Ecosystems, Vol 6. Rotschi, H., and L. Lemasson (1967). Oceanography of the Coral and Tasman Seas (H. Barnes, ed.). Oceanogr. Mar. Biol. Ann. Rev. 5, 49-97. Van Oppen, M.J.H., and J.M. Lough (Eds.) (2009). Coral Bleaching Patterns, Processes, Causes and Consequences. Queensland, Australia: Springer-Verlag Berlin Heidelberg. Webster, A.J., R. Bartley, J.D. Armour, J.E. Brodie, and P.J. Thorburn (2012). Reducing dissolved inorganic nitrogen in surface runoff water from sugarcane production systems. Marine Pollution Bulletin.